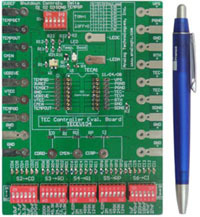 The TEC Controller Evaluation Board TECEV104 is consisted of a complete tunable compensation network and application circuit for using our TECA1 series TEC controller to drive a TEC. It can set the output voltage limit, tune the compensation network, set the set-point temperature, has an LED for indicating the temperature loop stat-us of the controller, and has numerous connection pads for making connections with external components and instruments. It is 100 % lead (Pb)-free and RoHS compliant.